New Balance is releasing another Made in England 1500 for Spring/Summer 2019 , following its recently unveiled legacy-celebrating SS19 pack. Where the pack saw the very best of New Balance's British-adopted designs combine with seasonal hues and luxury fabrics, the latest M1500 receives an all-over logo print in homage to the Made in England line. 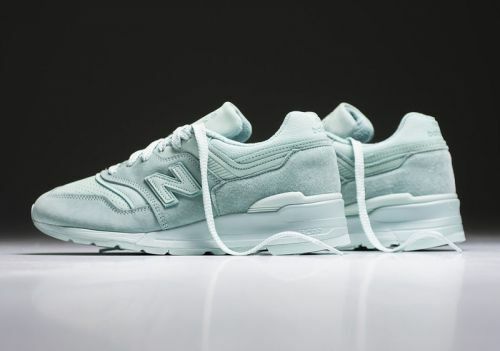 New Balance 's famed 997 silhouette is gearing up for the Spring/Summer season, seeing as it has been recently covered in a “Mint Julep” color palette. Like the frosty alcoholic drink that this model has been named after, the minty fresh tonal look takes over the Made In USA upper's leather and suede composition and follows right down to the partially exaggerated midsole. Laces and New Balance's "N" insignia also sport the “Mint Julep” look, while "New Balance" branding can be found debossed on both the tongue tabs and heel counters.